Pantry Storage – What's for Dinner Moms? How do you store your extra pantry staples? Do you shop only sales circulars? The above is one of my three shelving units that I have in my basement to store my extra supplies. I try to keep 3 months of staples so that I am not running to the store every time I make dinner. You know you will not walk out with just that one item you need. You will pick up extra milk and oh, look at those cookies in bakery! What about a loaf of bread for dinner too? The extra money adds up quickly. Instead of a $3.39 jar of mayonnaise you now have a grocery order of $50-$75. This happens to me if I have to just pick up one item. This is the unit at the bottom of the stairs. It keeps the items that I will most likely send the kids down to the basement to grab in a hurry. The little box on the third shelf is where we keep lunch snacks. The kids can go down and grab one and throw it in their lunch for school. When replenishing items we stock to the back just like the grocery stores. That way you are using the oldest first and the theory is that you will use everything before its expiration date. Now, this is supposed to be about three months of shelf stable pantry staples (including the other 2 shelves) . If you notice the second shelf I only have 3 boxes of pasta left. That is because pasta is going on sale this week. I will buy 11 boxes at $.90. For us and this area, that is a good price. I know just about how much of each item I will use in 3 months. So, I wait every 6-9 weeks for the sales of the items I use. There was a sale on chicken stock last week so I have 8 cartons. Plan ahead and buy on sale. Now, I also have my washer and dryer in the basement. Humidity! I only store the canned goods in that area. The boxes of crackers and cereal get soggy and develop a “taste” if not store in a dry area. Make sure you store each item in the best area or you will be throwing money away. How do you store your extra items? All very good tips! 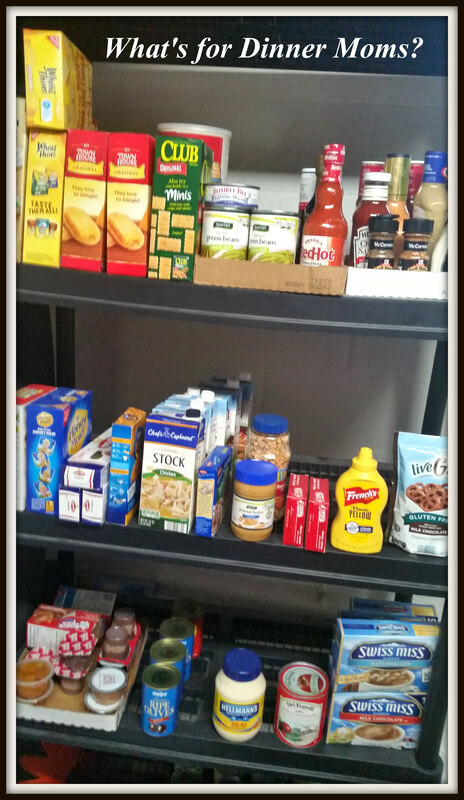 Hubby built a large pantry in our new house, which seems to be big enough for everything even when I stock up. But when I do get overflow, out to the garage shelving it goes! We have low humidity here so never have to worry about soggy crackers or anything. p.s. I always keep a box or two of the blue and orange for my daughter, who can eat an entire cooked box of it in one sitting! Lol. Yes, there is one box on the shelf which I was actually surprised to see when I went down to take the picture. Outstanding post. I hope you don’t mind if I re-blog it. This is so on point. Thank you! So very kind of you! Another Mom’s take on Pantry storage and keeping your Pantry out of a Wad. Wow! I could never be that organised ~ well done! I need to get our basement cleaned up of boxes so I can do more of this! As it’s only two of us and the pets, we don’t really need all that much, but it would be nice to have some emergency back up just in case, particularly during the winter months. The winter months are when I mostly depend on my pantry. Then I stock flour, sugar, peanut butter and juice. Things I do not stock normally in the summer unless they are a great buy. But, just figure out what the two of you eat in 3 months to get you through a sales cycle or two and you can start doing much of your shopping on sale. Thank you! Not really but I like to try and keep on top of it. In my dreams things would be alphabetized. Love it. Mine would be cans of crush tomatoes and BBQ sauce! I have a room in the basement that I converted to a pantry of sorts. I have 6 metal canning shelving units for home-canned goods, three shelving units for staples, one heavy duty shelving unit for more staples, and one metal shelving unit for canned flour, sugars, salt, etc. that I buy in bulk then store in canning jars sealed with my food saver. Right now though I have bags of staples on the floor waiting to be put away. It gets out of hand quickly. I typically buy at least three of everything that I use all the time and rebuy when I get down to the last one. I buy some things when they go on sale for the entire year because I know how much I’ll use, but that doesn’t always work out because I do run out of space. I can’t say mine is as organized as yours, but I know where everything is. I can tell the kids to look on such and such shelving unit, third shelf, left hand side — or wherever it might be. I spend enough time in the pantry, I ought to know where everything is! Wow! We do have the rule when you take a bag of groceries downstairs it must be put away. That was after I went downstairs after a $500 shop and all the bags were left on the floor. We had a family putting away grocery party with dance music. Lol. I don’t think my kids would put things away where I’d want them, so the bags on the floor are all me. I’ve got to get in the habit of putting it away right away. A dance party sounds good though — even if I have to dance with myself. It was good enough for Adam Ant (is that right?). Yes! I was down there to “teach” them how to put it away. Great idea to have a table! What is it about buying in multiple of three? I must always have 3 of everything in my “extra pantry” in the garage. We had floor-to-ceiling cabinets put along the entire length of the garage and I keep all of my over-run pantry out there. That and the deep freeze chest for the other extra storage. I am in the South and the humidity INSIDE this house stays an average 60%. So, no crackers/cereal/dry mixes in their original boxes, everything has to be stored in a tight-lidded container. I will be so glad when we move to a dryer climate and have a new house to store things properly and attractively. Be grateful for what you are able to store.